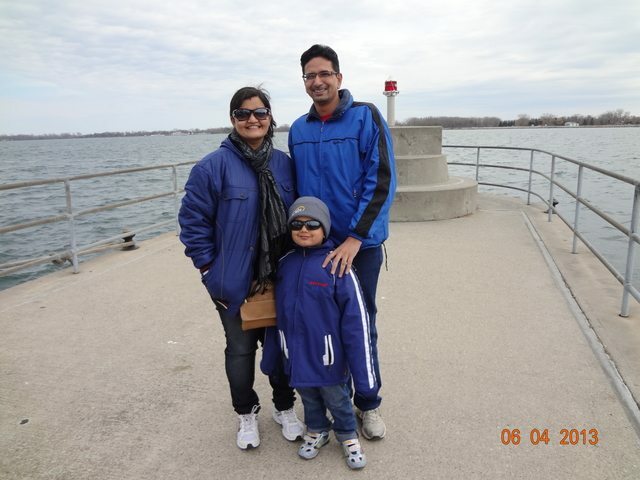 Toronto - CN Tower and Ontario Lake - Ghumakkar - Inspiring travel experiences. Hey, I am now at Toronto. One of the most multicultural cities in the world and is ranked as the safest large metropolitan area in North America. Today when I am writing this post I am completing my one month at Toronto. Due to God’s grace these 30 days went well here and I am hopeful we will have good time here. Toronto is a nice big city equipped with all the amenities and large Infrastructure. – It’s a multicultural city, no one feels alienated here. – Public transport is just superb here, still some say (Toronto Transit Commission)TTC is a weak system as compared to London and Newyork , they have to improve a lot. Citybus runs on trust e.g there are no conductors in a Bus , as soon as you enter inside the bus either show your pass to the driver or drop TTC (Toronto Transit Commission) token or 3 $ (Flat rate for using TTC) in the box. There is no one to check whether you had put the correct amount of coins or not. – In supermarkets, other than billing counters there are self check- out counters also where you can scan the items you are purchasing, make a bill, do payment and exit. – There is love in the Canada’s air. Everyone shows their love, affection anywhere and everywhere in the city. You will find so many lovebirds in the city. – New Construction has made arrangement in such a way that one can walk in a Weatherproof comfort. e.g Our Apartment is connected at the basement till supermarket, Subway station and till office. There is no need to come out of these areas in case of extreme weathers. Toronto’s underground walkway PATH (29 kms) is one of the largest underground shopping complex as per Guiness World records. – Most polite and most courteous people you will find here. I hear “Thankyou, please , excuse me” so many times in a day. e.g If you are clicking the photograph no one will ever cross you and they will wait till you finish clicking photographs. On pathway no one will cross you and not even will ask you to give side till the time you understand that the backside people in hurry and we should give side to them. – Difficult to find good vegetarian food. We now carry our own stuff with us whenever we are going out for sightseeing. – People here are still using coins i.e 1 cent, 5 cent, 10 cent , 25 cent, 1 dollar and 2 dollar. The largest denomination note I am using here is Dollar 20. – While travelling in subway (Metro) you will find dogs, pets and Bicycles inside your coach., which means you are allowed to bring your dogs, pets and bikes (Bicycles) inside metro. – Pedestrian crosses road only when signal for Pedestrian turns on. If there is a crossing without signal People give way to Pedestrians first to cross. – Senior Citizens enjoys here being independent with the help of Electric scooter specially designed for them. – Exclusive parks for Dogs/pets, where people can bring their dogs/pets and dogs can play with other dogs. In the first week of our stay here we went for apartment hunting. We had taken subway and got down at St. Andrew station. We actually reached 1.5 hours early at the place just to get the feel of city. 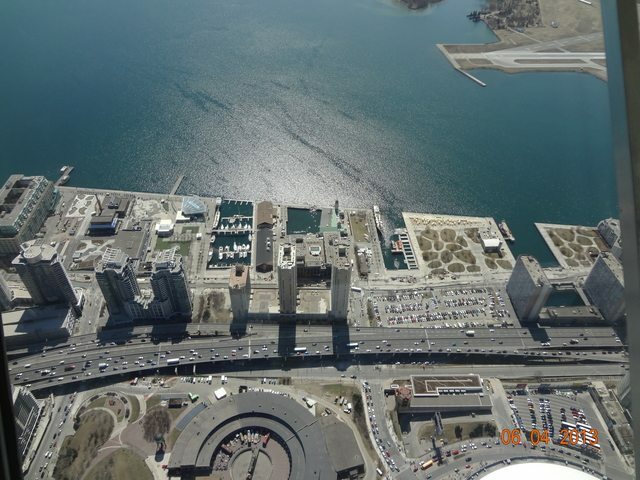 When we were exploring areas around St. Andrew station, we reached right in front of CN tower. I couldn’t resist myself and somehow convinced my hubby that we should see this. As it was Saturday the Reception hall was full. We stood up in line and purchased our Ticket. CN Tower – In 1995, CN Tower was classified as a one of the seven wonders of the modern world by the American Society of Civil Engineers. 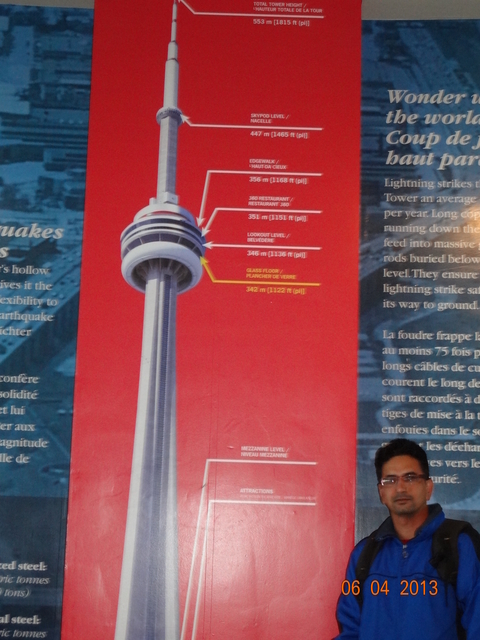 Defining the Toronto skyline at 553.33m (1,815ft5in), the CN Tower is Canada’s most recognizable and celebrated icon. 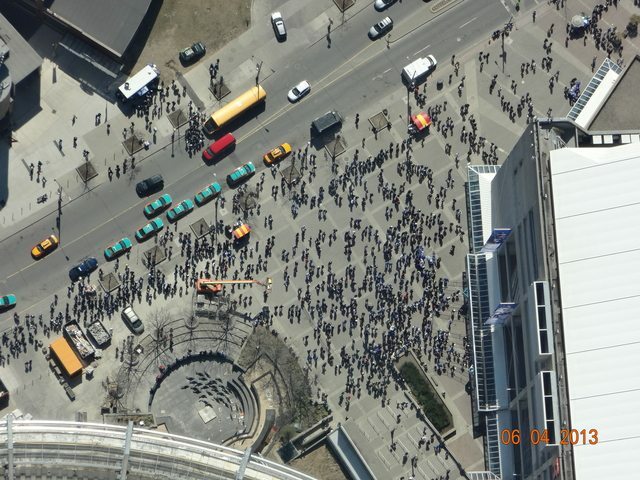 The entry ticket for CN tower general admission are 32$ for adult and 24$ for kids. 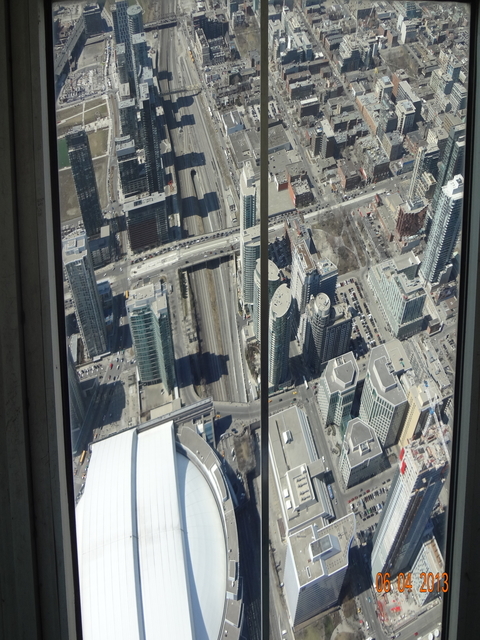 If you wish to go to till skypod (Last reachable point for visitors) 12 $ extra we should pay for each pay.So , it was a big chunk , approximately 140$ only for CN tower for three of us. We were not in a mood to pay this much as we had to save money till salary comes. We returned back, after reaching near gate we decided we should not miss this as we had reached here. So with confused state of mind we had purchased ticket. Along with ticket we got small pamphlet of CN tower as well as small activity book for kids. 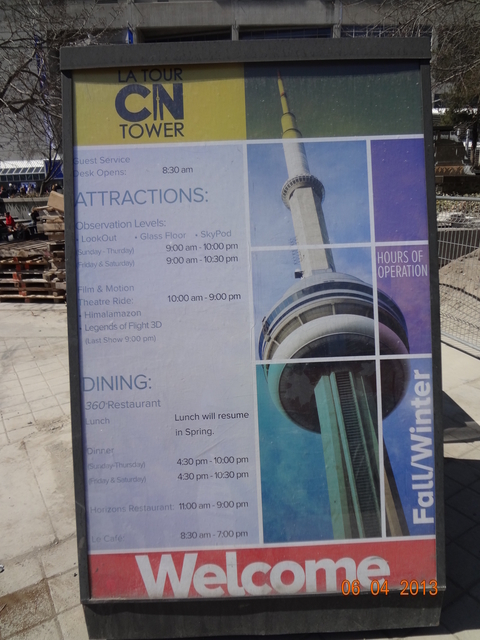 It has games /activities related to CN tower and a pencil for kids. At the entrance supervisor or senior staff was standing and she was guiding us the way towards elevator in a very polite manner with smiling face. There was security checking at the entrance. Advanced version of Metal detector or body scanner was installed at the entrance. For us, this was also new and we were excited to enter through that. After security checking we met two ladies, they told us that they will click our picture. We thought this may be some security purpose. All three of us stood and in a second, lady clicked our picture and handed over a card. It was written on card “ Please view and purchase your picture at….”. We felt cheated and decided we will not buy our picture. After security checking we saw small miniature of CN tower. 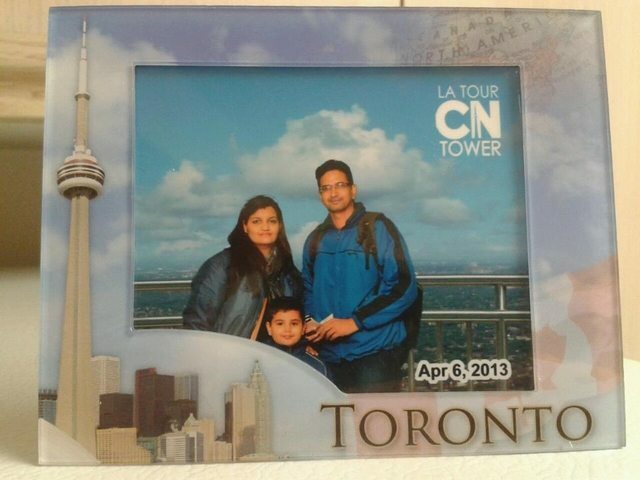 We clicked pictures near small CN Tower model and walked towards Elevator. At the same level there was Restaurant and Gift .We just ignored Restaurant and Gift shop and stood in a queue for Elevator. High Speed Elevator – We then entered in a high speed Elevator.CN Tower has 6 glass fronted elevators and you reach on top in just 58 seconds i.e 22Kms/hour.Out of these 6 elevators 3 elevators now have glass floor panel, so when you are in glass floor panel elevator , you can also experience 346m straight down view. When we were in Elevator the view outside was just superb. From lookout floor we had taken another (special Skypod ) elevator to reach Skypod which is again 33 floors above Lookout floor. 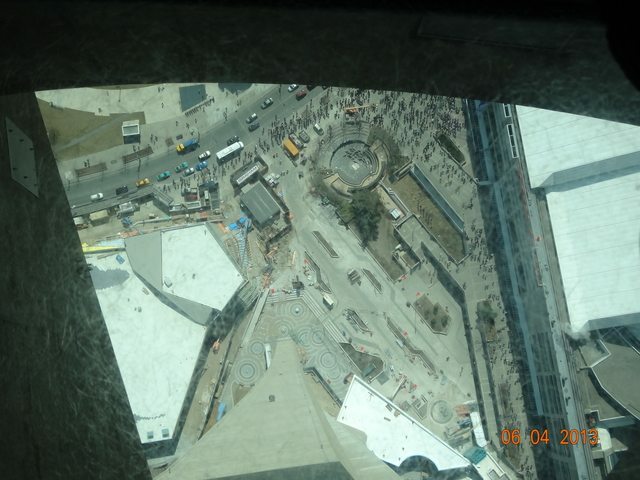 SkyPod – We reached at the top level (Permitted top level) of CN tower. This is at 447 m (1465 ft) above ground level.As the shape of structure at this level is round we can see 360 degree view of Toronto city. 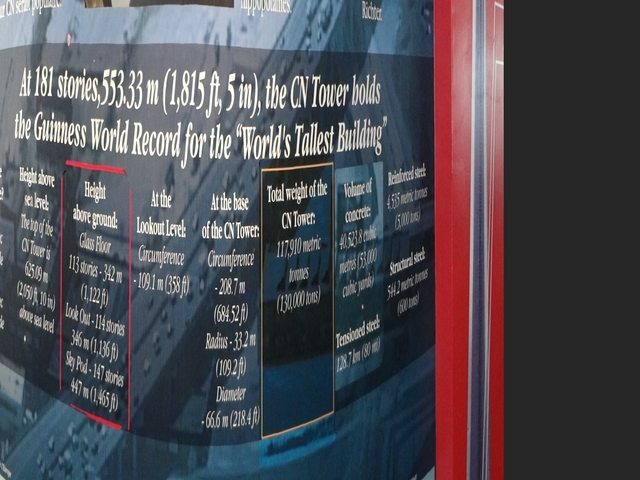 It says that if you visit CN Tower on a clear day you may be able to see Niagara Falls or Rochester, New York , as visibility at this level is over 160 kms. But we went on bad weather day so we couldn’t find much of long distance view.Its a closed glass structure at the Skypod level. We took back the Skypod Elevator and reached at Glass floor level. Glass Floor : At the height of (342m) 1222’ glass panels are fixed on floor. At this level we can see straight down. Even though I know it is completely safe , I was scared of stepping onto it. One can feel the height of tower at this level. Load tests are performed annually on each panel to ensure safety. The 256 sq.ft solid glass floor is five times stronger than the required weight bearing standard for commercial floors. In layman’s word, it can actually withstand the weight of 14 large hippos. Being a Civil Engineer as well as adventure loving person I loved to know about all facts, but still I was afraid. But on the other side my 5 year son was running, crawling, walking and sometimes jumping on the floor. 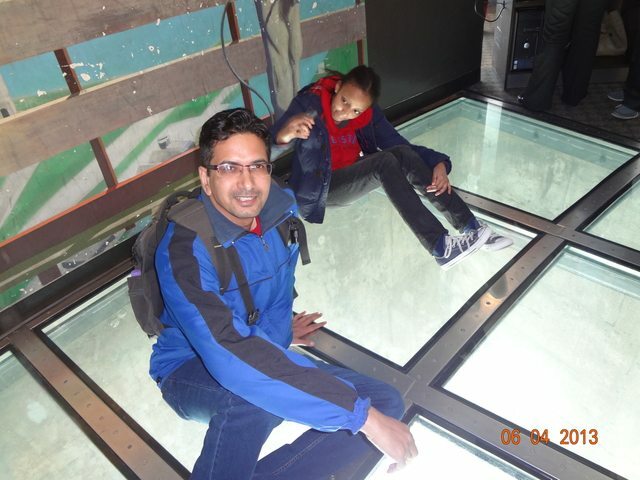 It was just amazing to see such a strong glass floor at this height. As Lookout floor was closed that day we went to Outdoor Sky Terrace. Again at 342 m (1222ft) but this time its open. As soon as we came to terrace we can feel the winter and breeze at Canada. It also says sometimes the temperature difference between ground level as well as top level is 10 degree.It was so cold and chilling that we were finding it difficult to stand. We quickly took half round and entered inside. 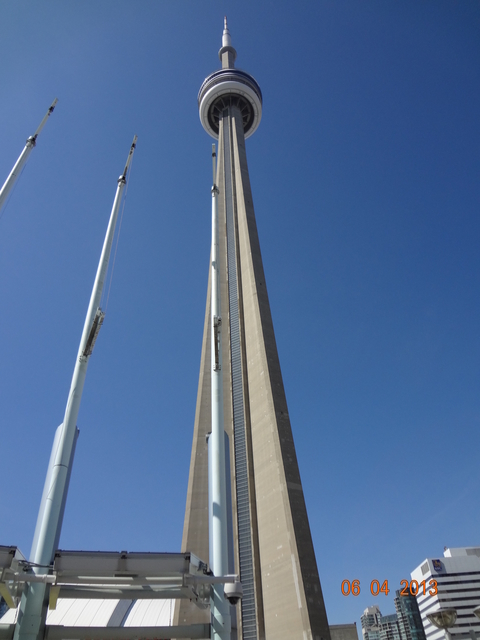 “EdgeWalk is CN Tower’s most thrilling attraction in its 35 year history, and the first of its kind in North America. 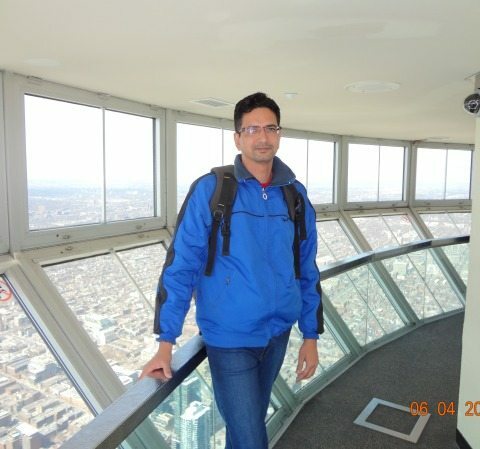 It is the world’s highest full circle hands-free walk on a 5 ft (1.5 m) wide ledge encircling the top of the Tower’s main pod, 356m/1168ft (116 storeys) above the ground. Visitors walk in groups of six, while attached to an overhead safety rail via a trolley and harness system. Trained EdgeWalk guides will encourage participants to push their personal limits, allowing them to lean back over Toronto with nothing but air and breathtaking views of Lake Ontario beneath them. Designed with the highest international safety and security standards in mind, EdgeWalk runs for 1.5 hours, with the outdoor walk lasting approximately 30 minutes. Tickets cost $175 CAD and include a keepsake video, printed photos and certificate of achievement. Participants also receive a Tower Experience Ticket which includes access to LookOut, Glass Floor, SkyPod, Movie and Motion Theatre Ride. The EdgeWalk at the CN Tower will operate seasonally in all weather except for electrical storms, high winds or other extreme weather conditions. Varying weather conditions will make the EdgeWalk experience more unique. We had finished Checking out top floors. Again took the glass fronted and glass floor panel and reached at ground level. Now the last attraction inside CN tower was a motion ride which is also inclusive in general admission ticket. CN tower staff guided us the way towards Motion ride. We had to wait in a hall for our turn to come. Our turn came in 15 minutes.It was similar to simulator ride we had experienced at Ramoji film city , Hyderabad. The motion ride was based on a story where mankind faces environmental disaster through years of over harvesting of forests,but Scientists have developed a “Super Tree” in a superworld called “Himalamazon”. The motion ride is a thrilling ride with special effects of wind, water etc. 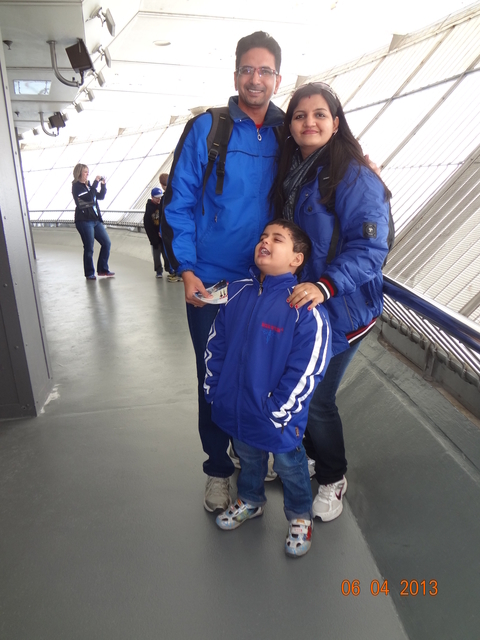 Now we had finished all the attractions inside CN Tower and we were in our way to exit CN Tower. On our way we saw photo counter.We just checked our photos.Our Photos were so good as they lifted our picture from a black background to outdoor sky terrace. But the charges were very high.There were two sets of pictures and it was costing us 30$.If we convert this in rupees then it is approx. Rs 1500/-.But looking at the picture we decided to take the picture. They even offered us to take soft copy in pendrive for an addition of 10$, but we refused. 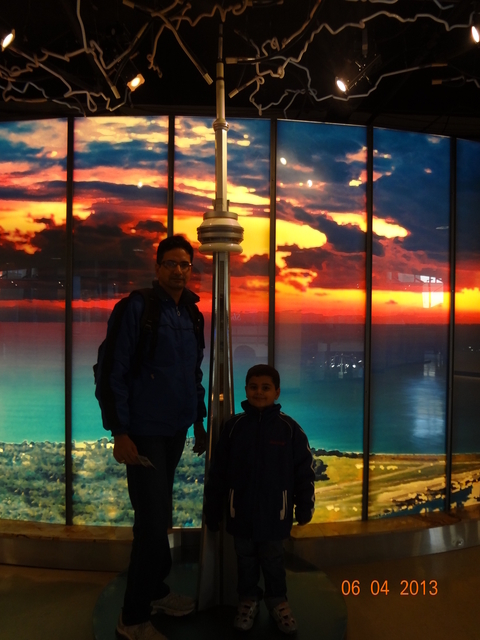 This finishes our Journey at CN Tower. Unplanned,unexpected (visit and expenditure) but full of experience and unforgettable moments. 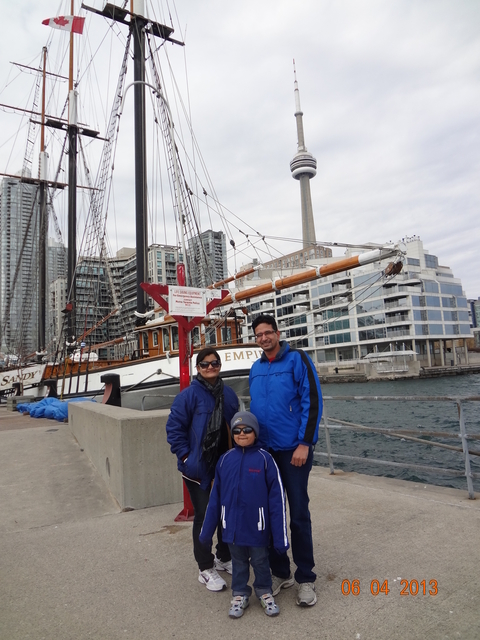 We came out of CN Tower and reached our friend’s place which was very close to CN Tower. They then took us to the Ontario Lake which was at a walking distance from their apartment. I will take you to Royal Ontario Museum and Castle Loma in my next post…Till then…Happy Travelling, happy reading !!!!! Asusual again an informative post. All post of yours are useful for fellow ghumakkars. Thanks for sharing the information. photos are brilliant. Thanks Saurabh for liking the post. quite informative as well as thrilling post.nice pics. A very well written post equally supported by beautiful pictures !! It was by chance or intensely you all three were wearing same colour (blue) jacket ? So now we have two prolific Ghumakkars in Canada. Enjoy and share the sights. The comment you mentioned is the same which disappeared or you didn’t type again? If its not same, then please post again. You give me a vertigo Abhee. I experienced the similar glass-floor thing in Tokyo but I guess that tower was much shorter than this one. Your observation about people is something I rue everytime I return to India after a short visit from outside. Thanks for sharing. Hope you got a good apartment. Thanks for comment.Glass floor at this height is really amazing. We found very nice apartment close to Ontario lake and I can see CN tower from my window. This is something I feel is destiny.Few months back I was dying to see CN Tower and sudden things changed and we found our Condo at such a beautiful location that now everyday I can see CN Tower especially in night when it looks wonderful with different lightings. पायलट द्वारा घोषणा थी ” बाहर का तापमान 30 डिग्री सेल्सियस है, प्लीज़ अपने सेल फ़ोन बंद कर दें ……..” यह केथी पेसेफिक की हांगकांग से दिल्ली वाया बैंकॉक की उड़ान थी. 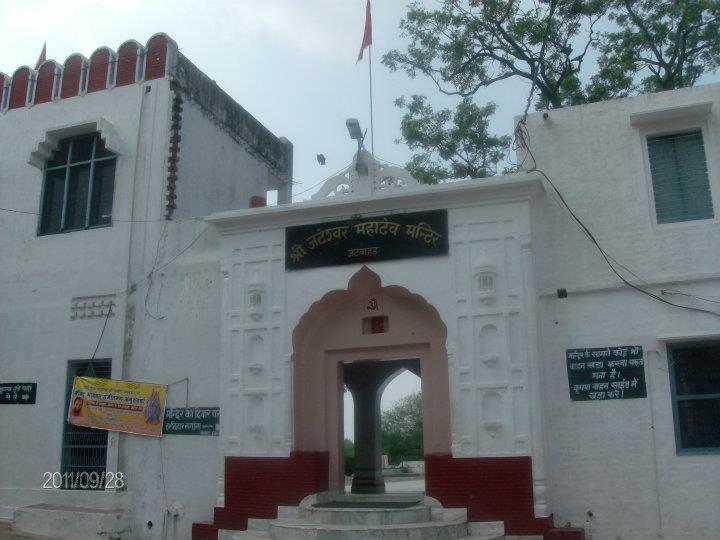 इंदिरा गांधी अंतरराष्ट्रीय हवाई अड्डे दिल्ली पर विमान धीरे धीरे नीचे आ गया था और इसे जमीन को छूने के बाद तेजी से यह चल रहा था . धीरे धीरे गति कम हु़ई और लोगों ने अपने सेल फोन शुरू कर दिए और सब व्यस्त थे. यह विमान 300 लोगों को दिल्ली ले कर आया था. कुछ मिनटों के बाद दरवाजे खोल दिए और लोग बाहर जाने शुरू हो गए .मुझे कोई जल्दी नहीं थी और मैं थोड़ा इंतजार के बाद अपना बैग ले कर बाहर की और चल पड़ा .